The term mendicant (from Latin: mendicans - "begging") refers to religious ascetics of various backgrounds who rely primarily (or exclusively) on begging and charity to survive. The practice of mendicacy is found in several world religions, and thus the term "mendicant" can categorize various types of ascetics such as Buddhist monks, Christian friars, Hindu sadhus, and dervishes of Sufi Islam. In general, mendicants (and religious mendicant orders) do not own property, either individually or collectively, and have taken a vow of poverty, in order to devote their time and energy to practicing their faith and serving the poor. In Theravada Buddhism, mendicants are known by the terms Bhikkhu (male) and Bhikkhuni (female), while in Hinduism they are known as Sadhu and sanyassi. Christianity has several official medicant orders (see below). The Order of Friars Minor and other Franciscan movements are disciples of Saint Francis of Assisi. Painting by El Greco. 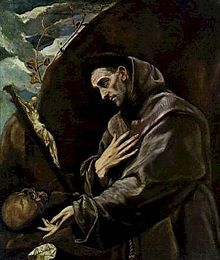 The formation of Christian mendicant traditions was inspired by several sources including Saint Anthony and Saint Francis, among others. The Second Council of Lyons (1274) recognized these as the four "great" mendicant orders, and suppressed certain others. The Council of Trent loosened their property restrictions. Afterwards, except for the Franciscans and their offshoot the Capuchins, members of the orders were permitted to own property collectively as do monks. Western Christian mendicant orders spend their time preaching the Gospel and serving the poor. The orders founded by Saint Dominic and Saint Francis were prompted by a concern to combat the Cathar heresy (in southern France and in northern Italy respectively) by offering a model of God being active within the community. They attracted a significant level of patronage, as much from townsfolk as aristocrats. Their focus of operation rapidly centered on towns where population growth historically outstripped the provision of parishes. Most medieval towns in Western Europe of any size came to possess houses of one or more of the major orders of friars. Some of their churches came to be built on grand scale with large spaces devoted to preaching, something of a speciality among the mendicant orders. A Buddhist Monk in Sri Lanka. 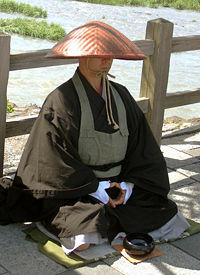 In the Theravada stream of Buddhism, a fully ordained male Buddhist monk is called a Bhikkhu (Pāli) or Bhiksu (Sanskrit) while a female nun is called a Bhikkhuni. Bhikkhus and Bhikkhunis keep many monastic precepts and their disciplinary code is called the patimokkha (part of the larger Vinaya). They live lives of mendicancy, and go on a morning almsround (Pali: pindapata) every day. The local people give food for the monks to eat, though the monks are not permitted to positively ask for anything. The monks live in wats (monasteries), and have an important function in traditional Asian society. Young boys can be ordained as samaneras. Both bhikkhus and samaneras eat only in the morning, and are not supposed to lead a luxurious life. Their rules forbid the use of money, although this rule is not kept by all monks. Their lifestyle is shaped so as to support their spiritual practice, to live a simple and meditative life, and attain Nirvana. Bhiksu may be literally translated as "beggar" or more broadly as "one who lives by alms." A bhikkhu has taken a vow to enter the Sangha (Buddhist monastic community) and is expected to obey rules of conduct (typically around 227 for a male) as set out in the Vinaya, although there are considerable local variations in the interpretations of these rules. A novice monk or nun in the Tibetan tradition takes 36 vows of conduct. A sadhu with begging bowl. The word "Sadhu" comes from the Sanskrit root sādh, which means "reach one's goal," "make straight," or "gain power over". The same root is used in the word sādhana, which means "spiritual practice." It is a common term for an ascetic or practitioner of yoga (yogi) who has given up pursuit of the first three Hindu goals of life: kama (enjoyment), artha (practical objectives) and even dharma (duty). The sadhu is solely dedicated to achieving moksha (liberation) through meditation and contemplation of God. Although the term Sadhu has its roots in Hinduism it is also used for followers of other religions, if they live a Sadhu life. Sadhus often wear ochre-colored clothing, symbolizing renunciation. 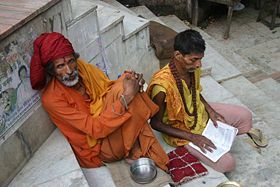 There are two primary sectarian divisions within the sadhu community: Shaiva sadhus, ascetics devoted to the god Shiva, and Vaishnava sadhus, renouncers devoted to the god Vishnu and/or his incarnations, which include Rama and Krishna. Less numerous are Shakta sadhus, who are devoted to the Goddess—or Shakti, the divine energy—in one form or another. Within these general divisions are numerous sects and subsects, reflecting different lineages and philosophical schools and traditions (often referred to as "sampradayas"). The largest Shaiva sampradaya is called the Dashnami—or Ten Names; sadhus in the sect take one of the ten names as an appellation upon initiation. The sect is said to have been formed by the philosopher and renunciant Shankara, believed to have lived in the eighth century C.E., though the full history of the sect's formation is not clear. The Vaishnava sect with the greatest number of members—and indeed the largest sadhu sect in contemporary India—is the Ramanandi sect, said to have been founded by a medieval teacher of bhakti, or devotion, named Ramananda. There are female sadhus—known as sadhvis—in many sects. In many cases, the women that take to the life of renunciation are widows, and these types of sadhvis often live secluded lives in ascetic compounds. Sadhvis are often regarded as manifestations or forms of the Goddess, or Devi, and are honored as such. There have been a number of charismatic sadhvis that have risen to fame as religious teachers in contemporary India. ↑ Arthur Anthony Macdonell. A Practical Sanskrit Dictionary. p. 346. Currier, Rev. Charles Warren. History of Religious Orders. A Compendioous and Popular Sketch of the Rise and Progress of the Principal Monastic, Canonical, Military, Mendicant, and Clerical Orders and Congregations of the Eastern and Western Churches. Murphy & McCarthy, 1894. Herkless, John. Francis and Dominic and the Mendicant Orders. T. & T. Clark, 1901. Sarnowsky, Jorgen, ed. Mendicants, Military Orders, and Regionalism in Medieval Europe. Ashgate Publishing, 1999. This page was last modified on 2 April 2008, at 12:09.